Tackle food preparation tasks safely by using this Victorinox 86003 UltimateSHIELD 2 medium cut resistant glove! Boasting a soft texture and feel, this glove is made of Spectra fibers that are 15 times stronger than steel, yet light enough to ensure uninhibited use. Its outstanding toughness and ambidextrous, 5-finger design will allow you to easily cut fruits, vegetables, herbs, and meats without the worry of injury. Featuring a 10 gauge construction and Level A7 cut resistance, this glove will provide your hands with the maximum level of protection. It even has 2 outer covers of industrial-strength polyester for a superior grip and abrasion resistance. 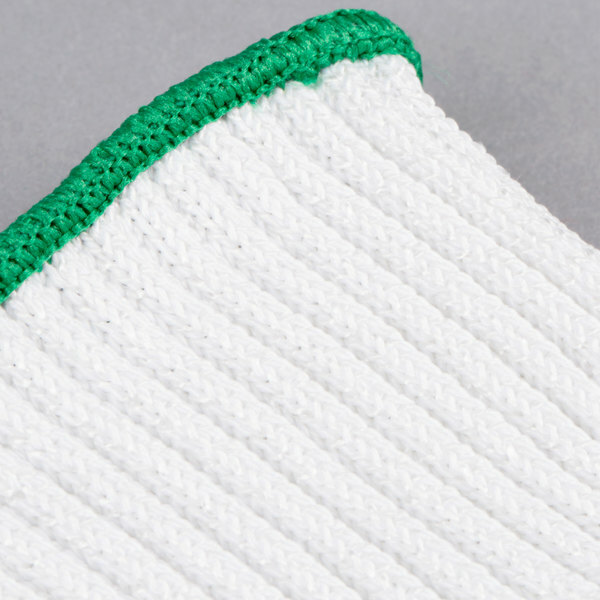 Not only does it incorporate anti-microbial yarns to reduce bacteria growth, it is machine washable and can be bleached for easy care. 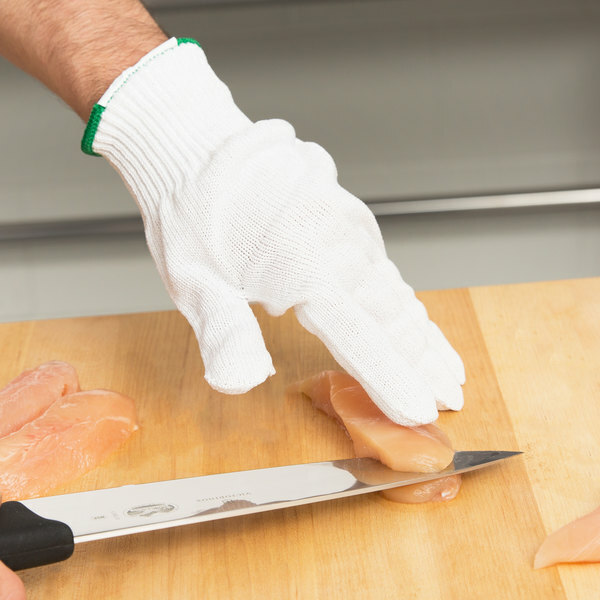 Use this glove to ensure ultimate safety in your restaurant or catering kitchen! Not for use with wavy or serrated blades. Washable and bleach-safe. This item protects hands against cuts. This glove is pretty good. I tested to see how much pressure I could apply with a knife before cutting through, and I managed to slice through a bit. However, I don't think i'll ever use that much pressure while cutting, so this glove should protect against small cuts. 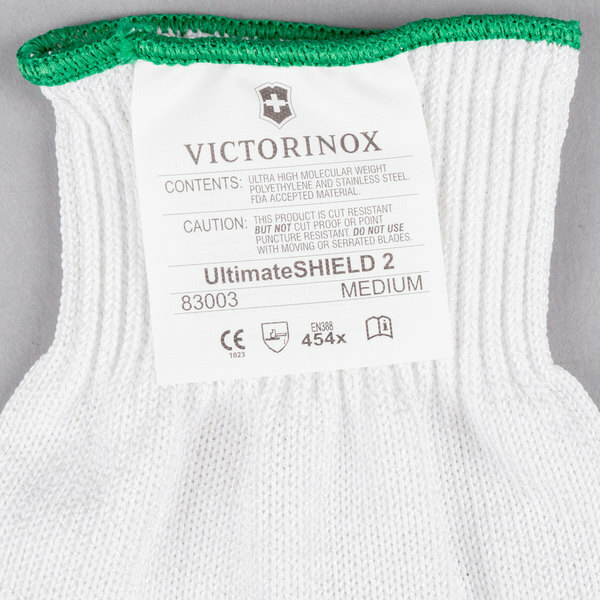 The Victorinox Ultimate Shield 2 cut resistant glove has a very high cut resistance rating. Its fabric is stiff, but not uncomfortable to wear or use. Great for employee safety. Good fit, 1 glove per package, very useful and protects hand, we use this to cut meat into slices for our meat processing jerky plant. Great gloves! We are constantly using knives in our store and these have saved a lot of people getting hurt. Very resistant and hold up great. These are perfect gloves for shucking bivalves! It can always be tricky and somewhat dangerous if you arent highly skilled! Makes it easy to shuck oysters and clams much faster!!! I like using then when shucking oysters and clams. When your oyster knife slips and stabs into your hand, this helps protect you from getting cut. 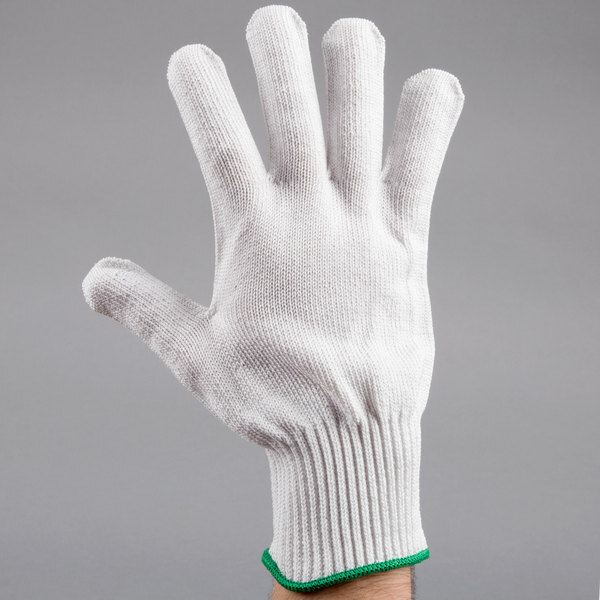 These gloves are a perfect addition to our processing business. The tight fit beats stainless chain gloves for ease of wearing all day and we have not had any problem with cut-thrus. This fits large! I bought the medium thinking it would fit me snug but like the other reviewer, it's huge. The medium fit right and slightly loose. I have larger than standard hands as well. Most would fit a small. My fingers are enlarged but even this fits loose on top. As for glove itself, amazing! I like that it's colored as white gets dirty quick. Very durable and you don't feel restricted when using. Better glove compared to others in market. Great gloves! We are constantly using knives in our store and these have saved a lot of hospital runs. Very resistant and hold up great. 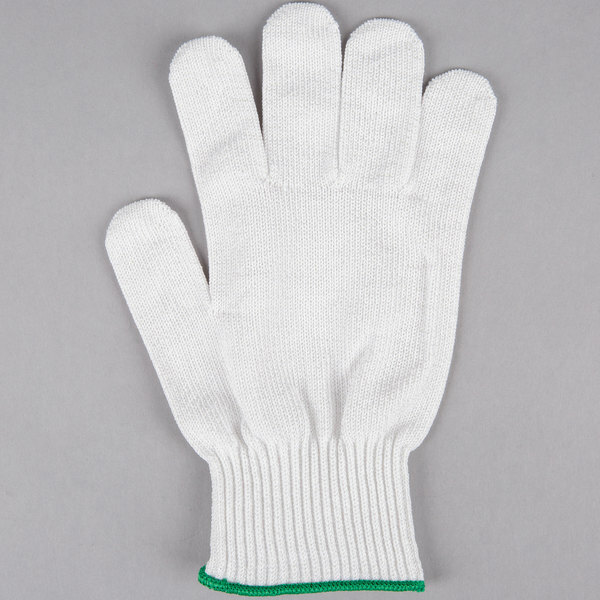 Great gloves - we cut meat daily and have been using the plain white gloves. These are so much better, they remain flexible instead of getting hard like the others and you'd never know the metal is woven into them. Size runs big, normally I wear a large or sometimes XL but I use a medium with these.